In 2016, all businesses were very aware of the Department of Labor’s attempt to modernize the regulations governing the executive, administrative and professional employee’s standard of earnings. This modernization was set to increase the annual salary for these positions to $47,476 per year, and this was to be in place by December 1, 2016, which was a Thursday, so it really meant we needed to make this change effective the week before to meet the requirements. We all did our due diligence, hung posters, wrote letters, provided notice, completed a review of the positions, made determinations, had conversations, and wrote more letters, and in many cases proactively updated our team members’ earnings to meet the new threshold. Then – at the 11th hour – the ruling was appealed, and we were all left with a feeling that our hard work was for nothing. However, there were positives to doing these assessments of our positions, and there is definitely a business case for the importance of completing an FLSA analysis on a regular basis. Did You Know the Department of Labor Launched a Misclassification Initiative? The Wage and Hour Division is working with the IRS and many states to battle employee misclassification and to ensure that workers get the wages, benefits, and protections to which they are entitled. The DOL entered into partnerships with 37 states to work together on this issue. The DOL states that they are all using their resources to address this misclassification problem. In 2015, $74 million in back wages were paid to more than 102,000 workers who were misclassified. In addition to fines and penalties for misclassifications, the 1st willful offense is equal to a $10,000 fine, 2nd willful offense is equal to imprisonment, oh and back wages for 3 years for willful violations. Take a moment to think about the time and paperwork involved in calculating back wages. Guess what, there are also Civil penalties – but I think I have your attention now, so we will move on. The FLSA, Fair Labor Standards Act, governs how to classify employees. There are many challenges with these the Non-exempt and Exempt classifications. For non-exempt classifications, you run into things like pre-authorizing overtime, approval of time cards, ensuring non-exempt employees are not performing work “off the clock” or away from the office and not being compensated. For exempt employees, the challenges are that a salary must be fixed and not subject to reduction due to change in quantity of work performed, they must be paid for any work week in which the employee performs any work, and employers can only make deductions or changes to pay in accordance with a written company policy. So, What Should Your Business Do Now? Conduct a job duties analysis of the actual duties performed vs the written job description to ensure accuracy of work being conducted. Sit down with your employees and have them show you what they do, ask them if there is anything on the job description they don’t do – and the key is, do this regularly. Review and revise the job description for each position and ensure it accurately reflects the work being performed by employees. Ensure classification as exempt or non-exempt is correct based on required criteria. Include designation of non-exempt/exempt on each job description. Review with the employee and have them sign the job description, and keep this document with the employee’s records. Employee communication is key, and we recommend you meet with your employees to discuss the changes to their pay structure and time reporting requirements. All employees that have a change in pay or exemption status should receive a change in terms of employment letter. Make sure you monitor morale and engagement of the workers transitioning to non-exempt, and make sure you address issues of work performance and workload schedules within the boundaries of a 40-hour work week. Purple Ink is on your team and able to help you and your company with an FLSA Assessment. 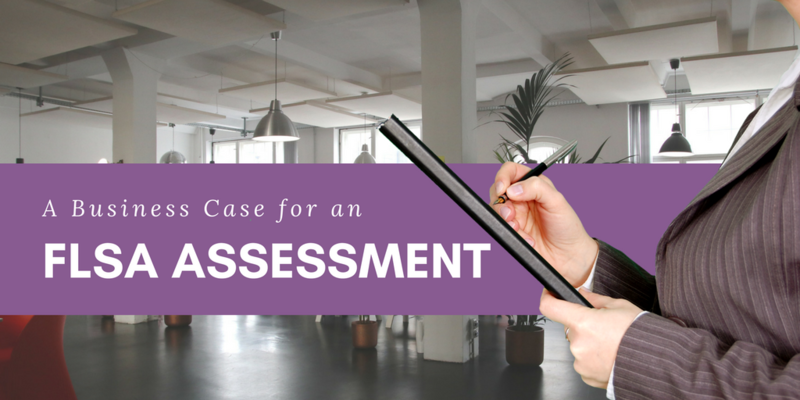 If you do not have the time or resources to devote to efficiently handling a FLSA Assessment, reach out to Purple Ink or me directly at stacy@purpleinkllc.com. I’d love to help you and your team. Want to know more? Read more about our services.